Rep. Trent Kelly addressed the Republican Women club audience on the topic of the special election. First District U.S. 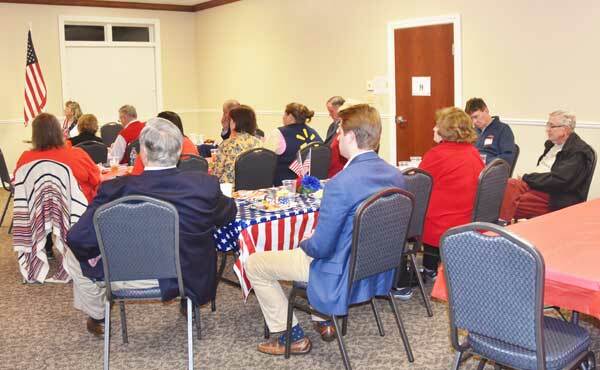 Congressman Trent Kelly spoke in New Albany Monday evening, Oct. 22, at the October meeting of the Union County Republican Women’s Club (UCRW). About 50 club members and guests were present. Kelley, a Republican, was first elected to the U. S. House of Representatives in a special election in 2015, following the death of the incumbent congressman. He is seeking his second full two-year term in this year’s election. Kelly is a member of the House Armed Services Committee and is a brigadier general in the Mississippi Army National Guard. Kelly spoke particularly about the special election Nov. 6 to elect a permanent replacement for long-time U. S. Senator Thad Cochran. Cochran has served in congress for over 45 years, when he resigned in April due to poor health. A portion of the audience at the October 22 meeting of the Republican Women Club. The election to replace Cochran is a non-partisan election, which means party affiliation will not be noted on the ballot. Governor Phil Bryant appointed Mississippi Commissioner of Agriculture and Commerce Cindy Hyde-Smith as Cochran’s temporary replacement. Hyde-Smith, who served in the state senate as a Democrat before being elected Ag Commissioner as a Republican, is one of four candidates on the ballot. Besides Hyde-Smith, there is one other Republican on the ballot, State Senator Chris McDaniel from Jones County. Running as a “Tea Party” candidate, McDaniel narrowly missed defeating Cochran in the 2014 Mississippi Republican Primary. Former U. S. Congressman and U.S. Secretary of Agriculture Mike Espy, who served in both offices as a Democrat, is running for Cochran’s seat. Espy and Hyde-Smith are leading in most political polls with McDaniel running third. Another Democrat, Tobey Bartee, a former Gautier city board member, is polling in single digits and not generally considered a contender in the Senate race. However, none of the four candidates are expected to receive the required majority on Nov. 6, and it is expected that the contest will be decided in a run-off election. Most pollsters believe that Espy and Hyde-Smith will be in the run-off election, but McDaniel is given a chance at making the cut. Congressman Kelly urged those present to vote for whichever Republican survives the Nov. 6 vote. Spokespersons for Hyde-Smith and McDaniel spoke Monday evening, as did a representative for Mississippi Secretary of State Delbert Hosemann. Hosemann is expected to run as a Republican for the office of lieutenant-governor in next year’s Mississippi elections. 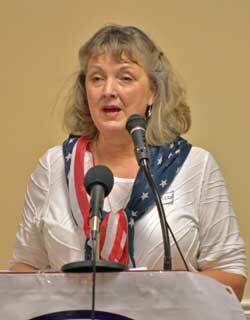 UCRW President Sue Morrisson presided at the Monday evening meeting and introduced the speakers. Good news for circus elephants comes from Florida.